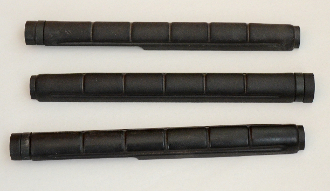 Excellent condition USGI solid handguard in black (original finish). There were a few solid handguards manufactured with a black (acctually VERY dark brown) original finish during the M14 production run in the early 1960's, apparently by over-coloring the batch with the standard pigment. Rare as heck, an oddity because the blueprint specifies a brown color. Excellent condition means that there are no significant cracks or chips and the finish is in excellent condition. There may be a slight finish rub or two. Really nice ones (like these) are getting hard to find.